Very few university students are able to live in buildings listed on the National Historic Register. Some at Wayne State are able to enjoy such a building. This nine-story apartment structure is listed on Michigan and National Historic registers because it clearly illustrates how the Italian Renaissance style was incorporated into high-rise apartment buildings during the decade of Detroit’s greatest population growth. For the most part, Detroit residences were single-family homes, but prior to the modern mortgages and numerous federal programs, it was costly to buy a home. Owners could realize gains from the appreciation of their property, but the tax advantages of owning were fewer in the 1920s than at present. Quite a few prosperous families preferred to rent, so developers built impressive apartment buildings although they were much less common in Detroit than in New York, Chicago or Boston. The Chatsworth Towers was constructed with attractive tan bricks and many Italian Renaissance details. Originally, it included 86 units. The interior was embellished with appealing woodwork and tile. The location was an ideal one for families. The excellent Detroit Street Railways offered frequent street car service on Woodward to the office building located near Campus Martius and to Highland Park where Ford and Chrysler had their headquarters. An underground garage for 65 cars was located underneath the Chatsworth. This was, apparently, one of the first such parking areas built in Detroit for the residents of an apartment building. Note that the developers and architects presumed that no more than three-quarters of the householders would want to park their cars in the building’s garage. As Wayne State University expanded after the 1960s, it incorporated this building that adjoined its campus. It now provides rental units for graduate and professional students at monthly costs ranging from $586 to $1,050. 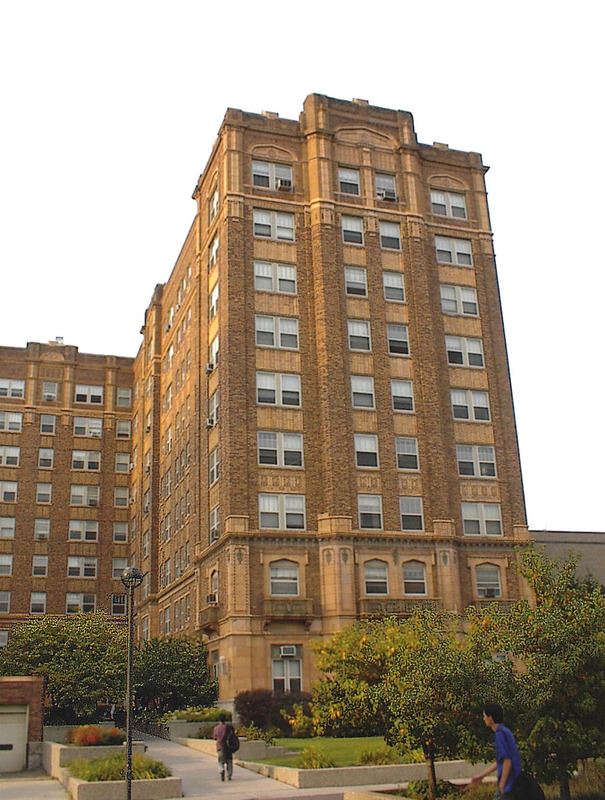 The Wayne State University Historic District does not, I believe, include Chatsworth Towers. That district includes just three buildings: Hilberry Theater, MacKenzie House and the Old Main Building of Wayne State. National Register of Historic Sites: #86001001, Listed May 1, 1986.